In 10-inch skillet, heat oil over medium heat 5 to 8 minutes or until hot (350°F). Unroll dough on work surface. Cut dough into 6 rectangles. 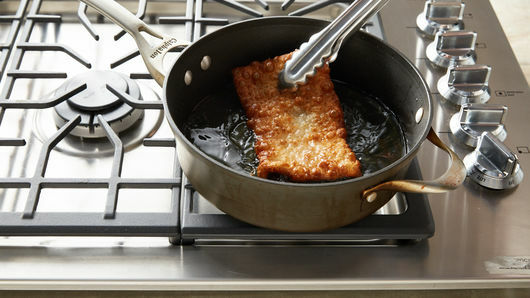 Carefully add 1 dough rectangle to hot oil. Fry 1 to 2 minutes, turning once, until golden brown. Remove from oil; place between layers of paper towels to drain. Repeat with remaining dough rectangles. Place chicken in small microwavable bowl. Cover with plastic wrap; microwave on High 1 minute or until warmed. Spread each flatbread with 1 tablespoon Caesar dressing. Layer evenly with chicken, bacon and arugula. Top with Parmesan cheese. 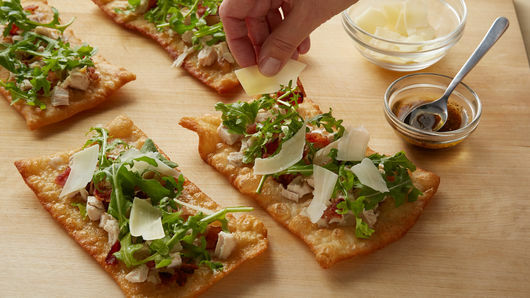 Drizzle each flatbread with 1 teaspoon vinaigrette dressing. Serve immediately. Sometimes there are perfect storms, when a series of bad events align to create devastating effects. But life also gives us double rainbows—those simple, perfect moments, that become our favorite memories. My double rainbow started in the desert of New Mexico. My family was had just started a month-long road trip visiting national parks across the U.S. This had been a lifelong dream of ours, and with my oldest child nearing adulthood, we knew it was probably the last opportunity we would have to take this trip as a family. Eight thousand miles of driving, 20 states and seven national parks gave us many memories, but one of my favorite was in Albuquerque. We noticed a hand-written sign for “Navajo Tacos.” We followed that sign, towing our camper through a residential neighborhood. Why go out of our way for Navajo tacos? Because of what they meant to my husband. He used to eat Navajo tacos at his best friend's house. His best friend’s family had taken him in when his own parents were going through a divorce. They treated him as their own and gave him shelter from the storms of life. When his biological mom left, his second mom, whom we call “Nana,” was there to pick up the pieces. One way she brought comfort to her family and to my husband was by cooking amazing food, Navajo tacos being a weekly staple. So, to see his excitement as he shared this memory with his own children was a perfect moment. Watching my family eat Navajo tacos, in a camper, in the desert, may not seem like much to an outsider, but to me it was a double rainbow. This recipe incorporates the fried flatbread from my husband's childhood with a new twist of flavors that my own family loves. 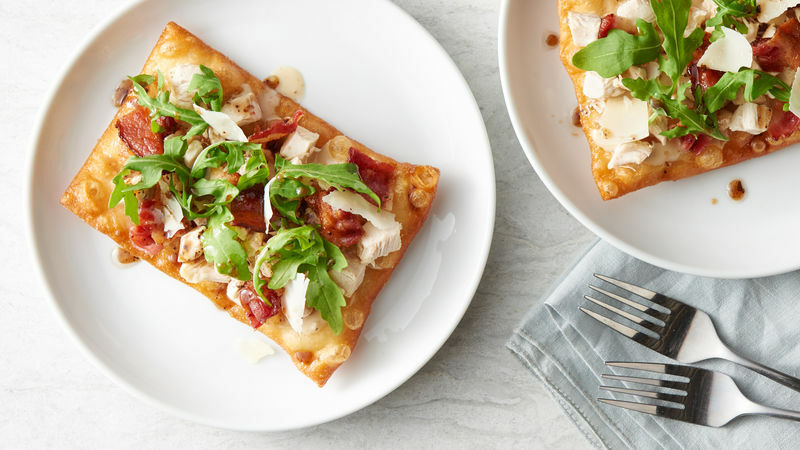 This recipe is made with love and filled with chicken, bacon, arugula, shaved Parmesan, Caesar dressing and topped with a balsamic vinaigrette. The perfect pairing of past memories and new adventures. Another double rainbow!